To use Git for versioning and collaboration, you need to initialize the book's directory as a Git repository and push it to GitHub or a repository on your server. To do this, switch to the my_book directory and run the git init command. Then, use the git remote add origin git@github.com:dmpop/my_book_repo.git command to connect the local repository to the one on GitHub. The next time you commit and push changes, open the terminal, switch to the my_book directory, and run the gitc command. The function uses the machine's hostname as the commit message, which offers a convenient way of identifying the source of the latest commit (which is handy if you work on the book from different machines). Once you've pushed the book to the GitHub repository, other contributors can review changes, create forks, and submit pull requests. You can also use Git to track changes and revert to previous versions, among other things. Even if you don't need this functionality for working on the book, you can use Git as a replacement for third-party file syncing services to keep the book project in sync on different machines. 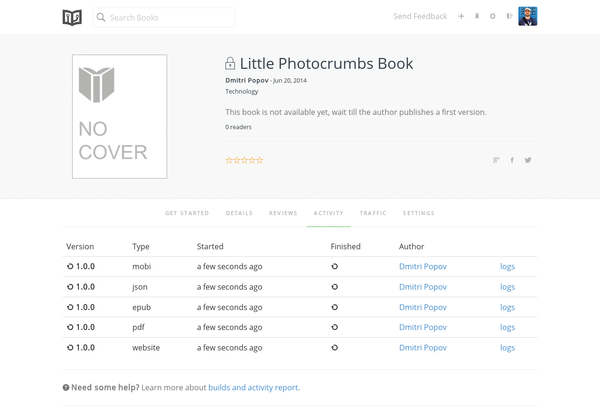 When the book is ready, you can publish it on GitBook. Before you do this, however, you need to add a cover and connect the editor to the GitBook service. To do the former, choose Book | Set Cover Picture and select an image you want to use as a cover. The image must be in the JPEG format, and its dimensions should be 1800x2360. To link the editor to the GitBook service, choose Book | Advanced Settings (Figure 5), enter your username and token in the appropriate fields, and press OK. Then, choose Book | Publish As, select the existing book item from the Book drop-down list, and specify the version number in the Version field. Hit OK to push the book to GitBook. Figure 5: Configuring advanced settings. Once the book has been pushed to GitBook, the service builds an ebook in the supported formats. You can monitor the build process in the Activity section of the book page on GitBook (Figure 6). Figure 6: You can monitor the status of the building process in the Activity section. The GitBook editor also lets you generate local copies of the book in different formats for distribution through other services and channels. Using the available build commands under the Book menu, you can output the book in the PDF, EPUB, and MOBI formats as well as generate a static website (Figure 7). Figure 7: Besides supporting the PDF, EPUB, and MOBI formats, GitBook editor can turn the book into a static website. Because any GitBook-based book is just a set of Markdown-formatted, plain-text files, you can use any Markdown editor for working with the book. 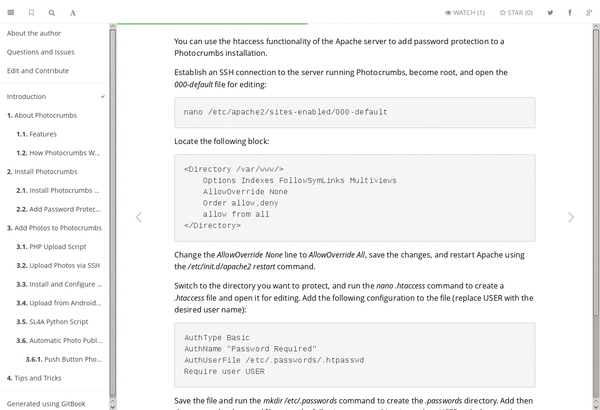 Of course, GitBook's own editor is still the best tool for the job, but in some situations, using it isn't an option. When you need to tweak a chapter on an Android device, you can use the excellent DroidEdit code editor  for editing and the SGit app  to pull and push changes. If you use GitHub for the book project, you might appreciate GitHub's own editor, which supports soft wrap and the Zen Mode for a distraction-free writing environment. Using the editor, you can edit the book right in your browser. If GitHub's editor is not your cup of tea, you might want to give Prose  a try. 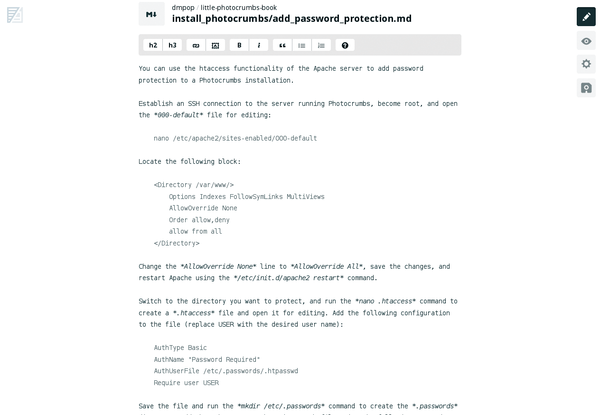 This slick and lightweight Markdown text editor integrates nicely with GitHub. Once authorized, the editor gives you access to all your GitHub repositories. 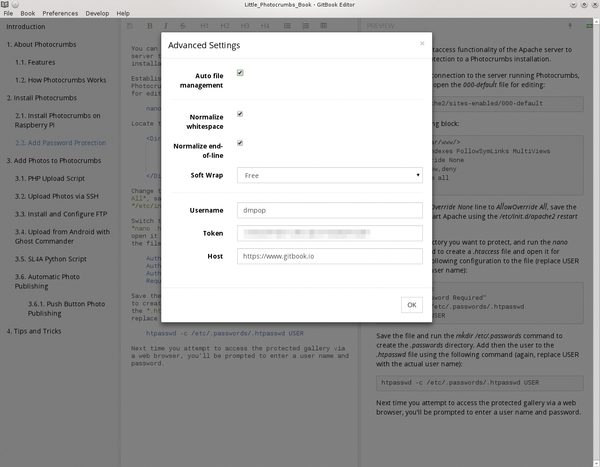 As a Markdown editor, Prose supports Markdown syntax highlighting, and the editor's interface features a toolbar that gives quick access to all basic formatting options (Figure 8). Figure 8: The Prose editor lets you edit files in a GitHub repository. Using the hosted version of Prose is the easiest way to start using the editor. However, the editor is released under an open source license, so you can grab the source code from the project's GitHub repository and deploy the software on your own server.